This artist's concept shows an unmanned NASA spacecraft approaching a near-Earth asteroid for capture and transport to a location near the moon. NASA's newly unveiled asteroid-capture plan is still in its early stages, but some details are already emerging about how the audacious mission might work. President Barack Obama's 2014 federal budget request, which was released Wednesday (April 10), gives NASA $105 million to jump-start a program that would snag an asteroid and park it near the moon. Astronauts would then visit the space rock using the agency's Space Launch System rocket and Orion capsule, perhaps as early as 2021. The space agency is still working out how exactly to pull off the mission, which officials are calling the "Asteroid Initiative" or "Asteroid Retrieval and Utilization Mission" at the moment. But a few things are already clear. For starters, the probe that will chase down and capture the 25-foot (8 meters) or so asteroid will be unmanned. And it will be powered by solar electric propulsion, which generates thrust by accelerating charged particles called ions. Ion thrusters have been used on other NASA probes, including Dawn, which recently spent a year orbiting the huge asteroid Vesta before departing for the dwarf planet Ceres. But engineers will need to develop an advanced version for the Asteroid Initiative craft, since it will be towing a 500-ton space rock over millions of miles. "This mission accelerates our technology development activities in high-powered solar electric propulsion," Michael Gazarik, NASA Associate Administrator for Space Technology, said in a statement. Still, it may take several years for the probe to meet up with the asteroid. 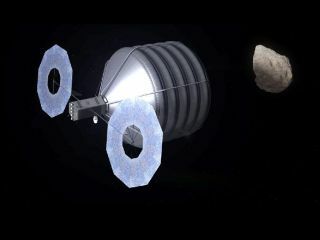 The spacecraft will then envelop the space rock with a bag of sorts, as a new video animation of NASA's Asteroid Initiative mission depicts, and de-spin the rock, likely using thrusters. The asteroid will then be towed to a "stable orbit in the Earth-moon system where astronauts can visit and explore it," NASA officials wrote in a mission description Wednesday. These visits will be made possible by Orion and the Space Launch System, which are slated to begin flying crews together by 2021. The NASA animation shows astronauts aboard Orion meeting up with the space rock, which the retrieval probe is still holding onto. In the video, the astronauts spacewalk their way over to the asteroid, accessing it by unwrapping a small section of the bag. They grab some pieces using a hammer and other tools, then come home with the samples in an ocean splashdown. The overall asteroid-retrieval idea is similar to one proposed by researchers based at Caltech's Keck Institute for Space Studies in Pasadena. In a feasibility study published last year, the Keck team estimated the total cost of robotic capture and return at $2.6 billion. NASA hasn't released its own cost estimates yet, but agency officials think they can get it done for less than that. "The Keck study didn't take into account all the activities we already have going on in our base, so we wouldn't need $2.6 billion in new money," NASA chief financial officer Elizabeth Robinson said during a press conference Wednesday. The Keck team also focused on grabbing a carbonaceous chondrite, she added. These asteroids are compositionally diverse, full of complex organic molecules, metals and volatile materials like water. But carbonaceous chondrites also tend to be found farther away than other types of near-Earth asteroids, Robinson said, making their retrieval more time-consuming and expensive. At this point, NASA isn't so particular about the space rock it hopes to target. "For those two reasons, we think that the price is likely to come in — of new money, new investment — at below that [$2.6 billion]," Robinson said.